Registration for the second annual Bloom Open – Golf Outing and Benefit Dinner is now open! 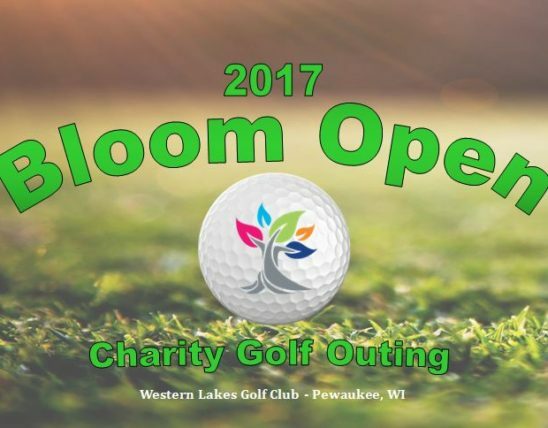 Bloom360 Learning Community, along with presenting sponsor Vista360, LLC, are pleased to invite you to a fun day of golf at Western Lakes Golf Club in Pewaukee, WI on October 5, 2017. The event will also feature a dinner, silent auction/basket raffle and short program, which you can attend if you’re not able to golf. The golf outing and benefit dinner is a major fundraiser for Bloom360 Learning Community, a new non-profit school which is set to open in September 2017 at its newly purchased and renovated location in East Troy, WI. Bloom360 will help students living all over Southeastern Wisconsin with neuro-diverse needs who aren’t thriving in a traditional classroom. Bloom360’s incoming class of learners and their families each have a unique and inspirational story about why Bloom360 is needed in Wisconsin. Currently, there simply is not a learning environment in the state like the one Bloo360 has developed. At the inaugural 2016 Bloom Open, Bloom360 was thrilled to welcome more than 160 guests who participated in the golf outing and/or dinner and was so appreciative of the 26 sponsors, many silent auction contributors and numerous volunteers who helped make the event an enjoyable success. The 2016 event raised over $33,000, which helped support the development of Bloom360. The 2017 Bloom Open tees off on October 5 at 12:00 with a shotgun start. Your $125/golfer registration includes lunch, free practice range time, 18 holes with a cart, and dinner with a silent auction/basket raffle. If you’d rather not golf or can’t make it to the golf portion of the day, you can attend the dinner and silent auction/basket raffle for a $50 registration, which will begin with a cocktail hour at 5:00 and proceed with a dinner buffet at 6:30. There are a couple of other ways to get involved in this event, including sponsorship opportunities, making a donation to the silent auction or volunteering your time. These opportunities not only help support Bloom360 Learning Community, but allow you and/or your organization to be recognized at the event. Sponsorship opportunities begin at $250 to sponsor a golf hole with a sign including your name/logo at a tee box. Further information regarding registration and sponsorships can be found at the Bloom Open event website. At the linked site, you can register for golf or as a dinner-only guest and sign up for a sponsorship using a credit card or PayPal account. New this year is a sponsorship for a table of eight at the dinner. You also can register, sign up for a sponsorship or make a donation to the silent auction through the mail by downloading a registration packet. If you have any questions, feel free to reach out to Patrick Braun at (414) 935-6360 or info@bloom360.org.